Sen. Kamala Harris of California railed against Congress‘ inability to pass „smart gun-safety laws“ during a CNN town hall at the Sheslow Auditorium in Des Moines, Iowa on Monday night. Harris referred to failed legislation following the Sandy Hook mass shooting in 2012, where 20 children and six adults were killed. 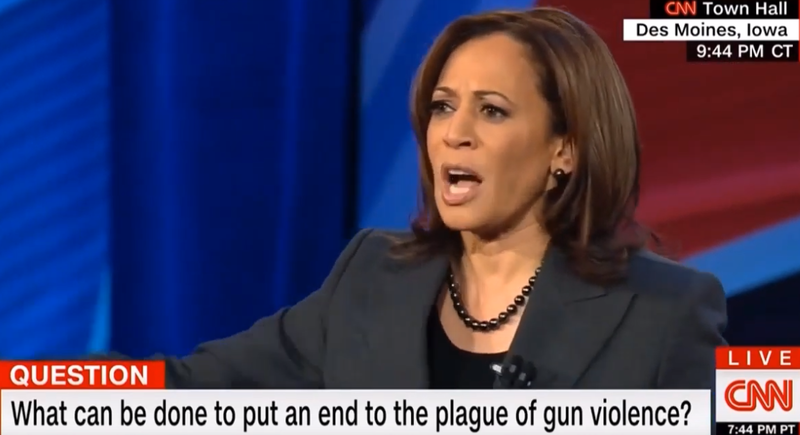 Sen. Kamala Harris of California, a Democratic candidate in the 2020 US presidential election, decried the absence of a unified stance on gun-control during a CNN town hall at the Sheslow Auditorium in Des Moines, Iowa on Monday night. Harris, who was answering a question from a Des Moines-based pastor, railed against Congress‘ inaction following the Newtown, Connecticut, shooting in 2012, where 20 children and six adults were killed. Harris advocated for „smart gun-safety laws“ and highlighted the „false choice“ narrative from some firearm advocates. Harris argued that „reasonable“ reforms, such as universal background checks, were imperative and needed to be passed by Congress. „You can be in favor of the Second Amendment and also understand that there is no reason in a civil society: that we have assault weapons around communities that can kill babies and police officers,“ Harris said. Private-party gun sellers and gun shows are not currently required to conduct background checks on buyers. Legislation for universal background checks is supported by a majority of Americans, including 79% of Republicans, according to the Pew Research Center. The bipartisan proposal has eluded Congress for years, even as the death rate from firearms continued to climb in 2017. Nearly 40,000 people were killed by firearms that year, according to the latest estimates from the Center for Disease Control and Prevention. In January, House Republicans and Democrats reintroduced a measure for universal background checks. The measure still faces stiff opposition from the Republican-majority Senate.